Art for me is about learning, expressing emotions, points of view, identity, and stories, visually. It is the ever shifting concoction of work and play. I am a woman, a wife and mother, known to slip into a dreamy appreciation of a composition I see in a face or space before me. Sometimes my focus shifts at inopportune times, like during a conversation, as a greater understanding suddenly becomes clearer; painting ideas are formed. I like to share my visions and be seen, make connections and feel understood. My whole life I have always looked for color to relay my mood or lift my spirits. I’m curious about all kinds of relationships. I explore them within my subject matter and by employing a variety of mediums, including photography, charcoal, watercolors, acrylics and felting fibers. I move between, translate, layer and combine, these different mediums, using the properties of each one to reach new levels of understanding, express sensuality and build depth. I enjoy the versatility of acrylics to be thick like oils or layered thin like watercolors. 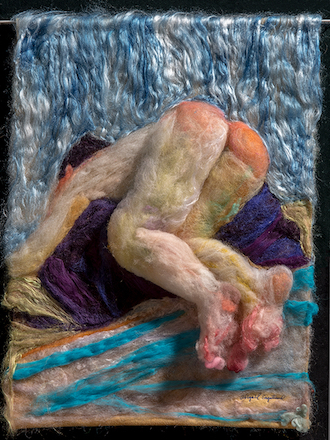 During my children’s Waldorf elementary years, I began creating pictures by felting fibers: silk, wool and animal hair. I reuse scraps of clothing, and blankets, upcycling and adding sentimental symbolic meaning to the picture. Just like watercolor puddles and children, fibers have a life of their own to lend to a planned picture that toys with levels of control. There’s a constant dance working with them. Decisions have to be made about where boundaries are needed and when and where to let go. They beg me to look, listen and learn from the newly altered perception they’ve created. Different fibers shrink and felt in different amounts creating unforeseen buckles and waves. Felting often becomes more sculptural than painting. The 3dimensionality of the fibers can change the proportions depending on the direction of the light hitting it and the standpoint of the viewer. What bolsters my patience through frustrating times is the sheer joy of playing with them. I add fragrant essential oils to my hands as I work the fibers to add yet another dimension to the work. Engaging all my senses, together, I recognize old patterns, create new definitions and discover different directions! In Pause to Connect, an acrylic figurative painting, extended in fiber, I wanted to connect generations, fine art reflection with domestic craft, long labeled women’s work. In my choice of subject matter and medium, I note the importance of pausing, using all our working senses to appreciate this life, be oneself and reach out to others. In this piece and other works, I pride myself on my ability to empathize and express what others feel but maybe cannot express. I love to transform a space with color and light, and create pictures that capture a feeling, a memory, a personality, that will be valued for years, or maybe even generations. This present perception connects me, the subject, and the viewer with the overlapping past and future.